Construction Machinery Trader Commercio Import-Export macchinari edili e movimento terra. C.M.T. 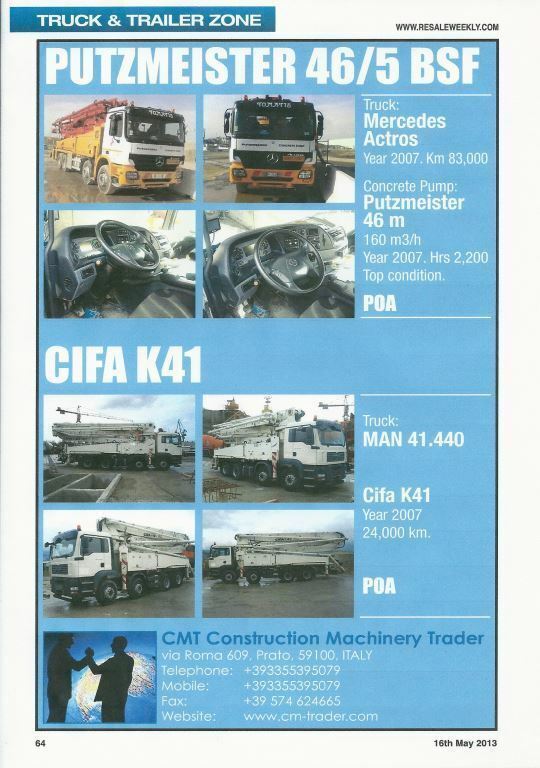 “Construction Machinery Trader" is a commercial Company dealing all brands of used construction machinery. We are a modern company with partner in all over the world in continuous contact with us for commercial exchanges in whole Europe, Africa, Middle East and South America. We are a leading company, reaching all corners of the world and developing a new working technique using the technology and potential of internet which is an aggressive and effective way to connect and manage thousands of potential customers. C.M.T. "Construction Machinery Trader" can offer the research of the best transport and customers solution, documentation and everything concerning the delivery of the machine to the final destination without any adds to the price. We can supply any kind of machinery in any part of the world. . Send us your request, we are one step ahead. C.M.T. “Construction Machinery Trader” es una nueva empresa que comercializa todas las marcas de maquinarias usadas para la construcción. Somos una moderna compañía con socios alrededor del mundo en permanente contacto con nosotros para intercambios comerciales en Europa, África, Medio Oriente y Sudamérica.Somos una empresa líder que llegamos a todos los continentes desarrollando una nueva técnica de trabajo como es el uso de la tecnología y el potencial de Internet, constituyéndose este elemento en una forma agresiva y efectiva para conectar y manejar miles de actuales y futuros clientes. C.M.T. "Construction Machinery Trader" ofrece además el servicio de búsqueda del mejor transporte y solución para quien así lo requiera, documentación y todo lo relacionado con el despacho de la mercadería al destino final y sin añadir más costos al precio. Podemos suministrar todo tipo de maquinarias en cualquier parte del mundo. Envíenos su solicitud, estamos un paso por delante!! Why C.M.T. Construction Machinery Trader? C.M.T. Construction Machinery Trader save your money and your time taking care of everything. Our customers require specific machines to work, we know it and we will do it for you. The efficiency of these machines is always at the highest level. We try and check, machinery, and we watch them with your eyes. Full assistance during and after the sale to your every need. consultancy on the best way to move the cargo, kind of insurance, road permits, customs service. with unrivaled convenience and remarkable speed. This is possible because we always choose the best for our customers. L'amarezza di una scarsa qualità, rimane a lungo dopo che la dolcezza di un prezzo basso è dimenticata.